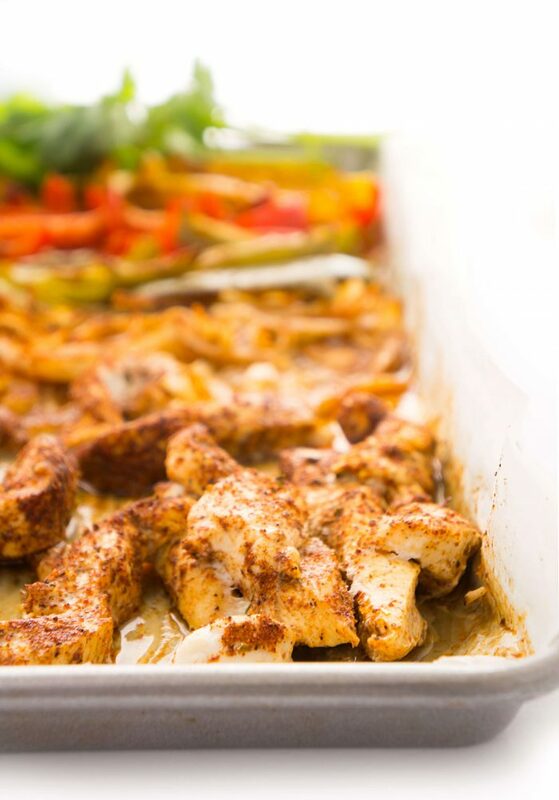 A few weeks ago, I posted this Sheet Pan Greek Chicken & Veggies recipe – one of our favourite easy meals these days. Well, after trying out that recipe, I decided that I loved sheet pan meals SO MUCH that I was going to incorporate them on a regular basis. They’re SO easy and everything cooks at once on the same pan. Just what this mama needs! 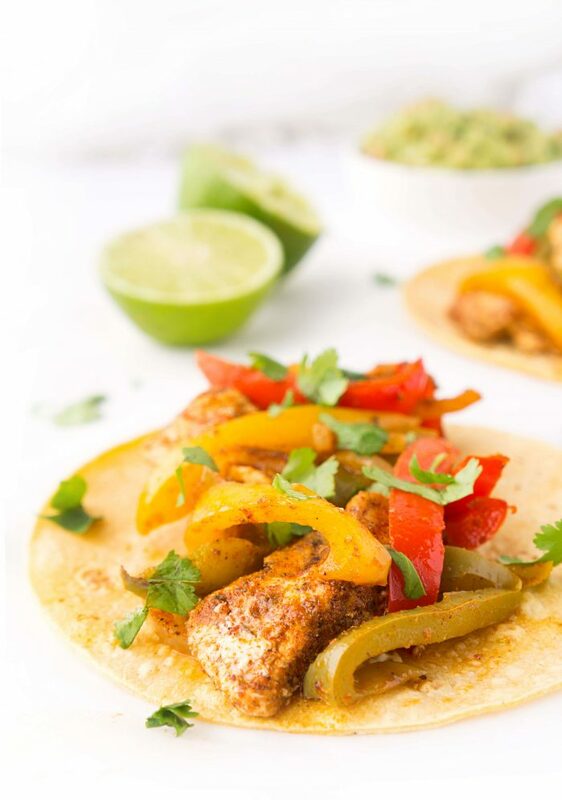 We’re huge fans of Mexican flavours and usually have a taco night or some type of Mexican-inspired recipe AT LEAST once a week, so I decided to come up with a Sheet Pan Chicken Fajita recipe to switch it up! 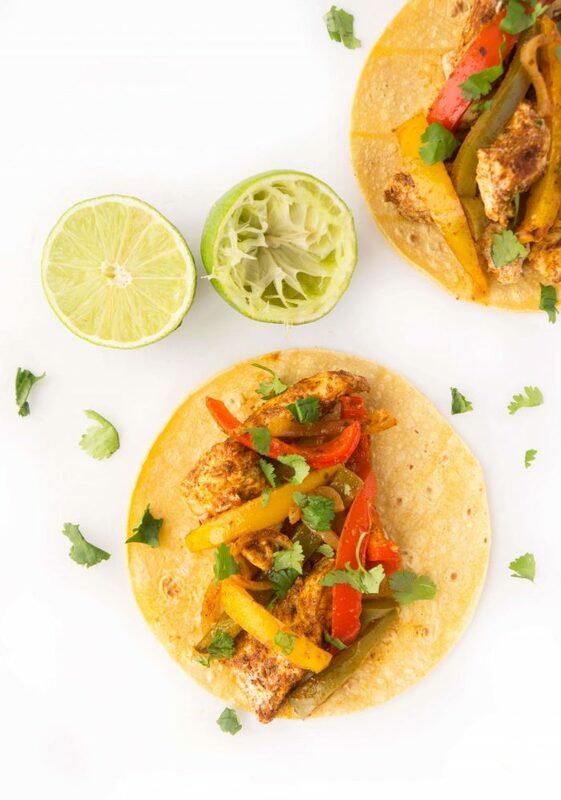 Now just as a testament to this recipe’s overall deliciousness, my husband doesn’t generally get overly excited about any recipe in particular (even if he likes it), but after making these sheet pan chicken fajitas a few times, he actually said that this was quickly becoming one of his favourite meals. 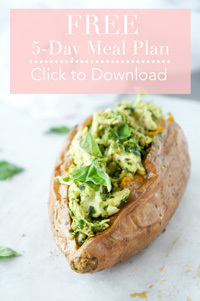 In other words, this recipe is a winner! So it’s pretty hard to screw up this recipe, but there are a few tips to keep in mind to ensure that it turns out extra tasty. First, you’re going preheat the oven to 400 degrees F.
Slice up the chicken breasts, peppers and onion. When doing this, be sure to slice both the chicken and veggies into pieces that are about the same thickness so that they all cook up evenly and finish cooking at the same time. To make this meal super easy, I suggest making up a batch of this homemade taco seasoning in advance so that you simply have to dump it in with the rest of the ingredients when you’re ready to make this recipe. 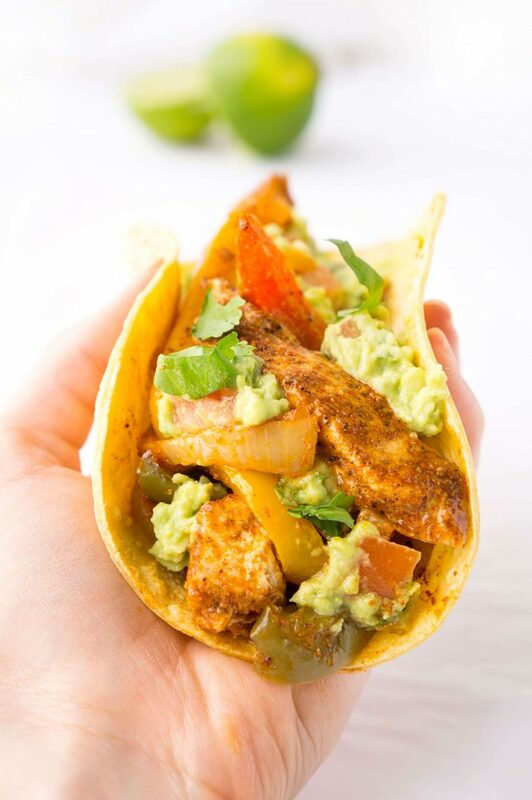 The taco seasoning recipe results in enough seasoning to make about three of these chicken fajita meals, so it’s perfect for meal prepping. You can use it for tacos as well, as the name implies. Next, you can either place all of the ingredients in a large bowl and give it a good toss until well combined. OR if you want to save on dishes, you can just arrange the chicken and vegetables directly on the baking sheet. You can either arrange it in layers (as pictured below), or just toss it all together on the pan. I arranged it in layers because I thought it looked cool, but if it’s easier to dump it on the baking sheet all mixed together, then go ahead and do that! Drizzle on the olive oil, lime juice and taco seasoning and toss so that the veggies and chicken are well coated. Place in the oven and bake for about 25-30 minutes or until chicken is cooked through and no longer pink inside and vegetables are softened and lightly browned. Now this is the fun part because you can really serve up the chicken fajita mixture however you’d like depending on what you’re feeling that day. 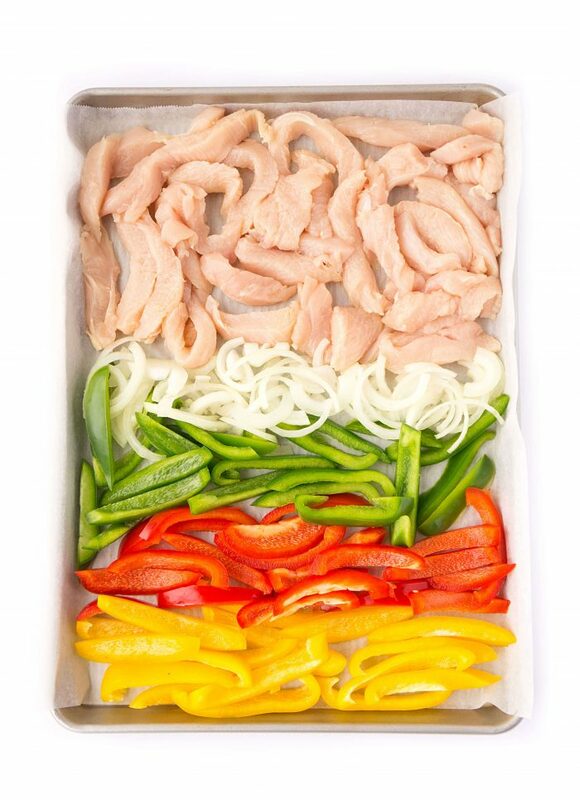 How long do these Healthy Sheet Pan Chicken Fajitas last in the fridge? 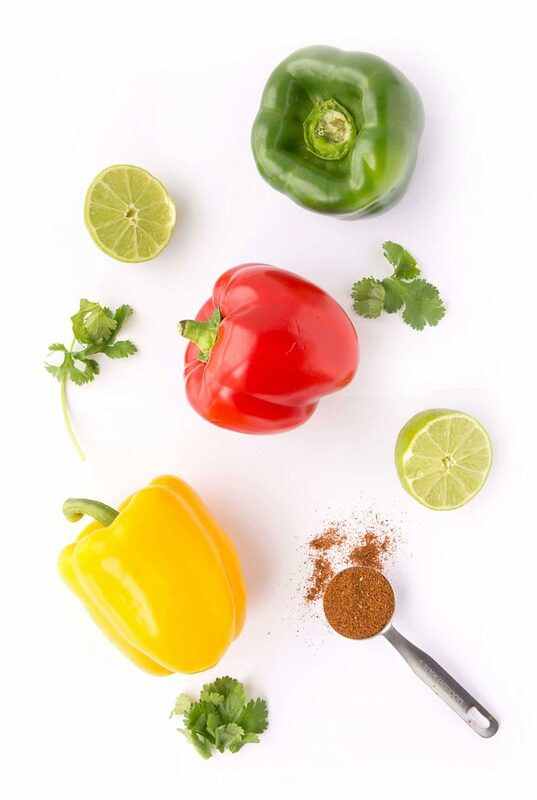 You can store the chicken fajita mixture in the fridge for up to four days, which makes it perfect for meal prepping. If you’re making it just for yourself, you could divide the mixture up among four containers and you have lunch or dinner for the next four days! Such a great time-saving strategy! Or if making it for the whole family, you could double the recipe and one night serve it on corn tortillas, and another night serve it on a salad or rice. Gotta love those quick and easy meals! 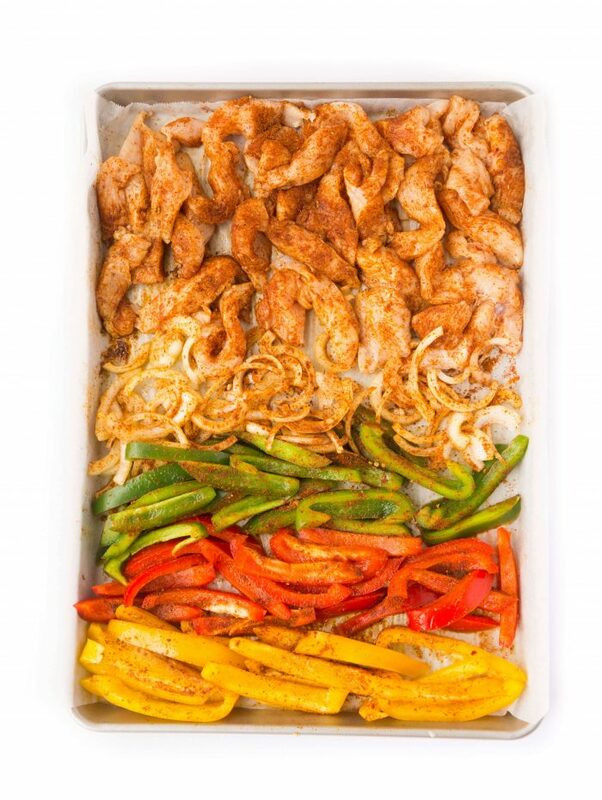 How would you serve up these Sheet Pan Chicken Fajitas? Preheat oven to 400 degrees F. Line a baking sheet with parchment paper or foil. Add the sliced chicken breasts, peppers, and sliced onion to a large bowl. Or alternatively, you can place it all directly on the baking sheet if you want to save on dishes. Next, add the lime juice, olive oil to the mixture and toss until the chicken and veggies are coated. Next add the taco seasoning and give it another toss to evenly distribute among the chicken and veggies. Spread the mixture in a single layer on a baking sheet. You may need to use two. (You can skip this step if you opted to place the chicken and veggies on the baking sheet right from the start). Bake for 25-30 minutes, flipping half way through cooking time, or until chicken is cooked through and vegetables are slightly browned and crispy on the edges. Serve on corn tortillas, rice, or a salad and top with avocado or guacamole, cilantro, salsa, Greek yogurt or sour cream. 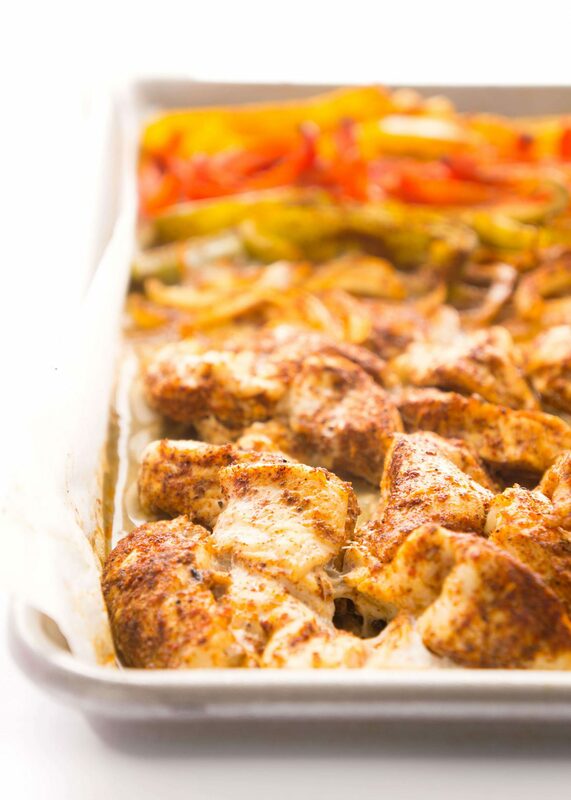 If you have a chance to make this Healthy Sheet Pan Chicken Fajitas recipe, I’d love to see it! Tag me on instagram @hauteandhealthyliving and use the hashtag #hauteandhealthy!